(Seychelles News Agency) - Seychelles is joining Mauritius and other partners to work towards the better management of the Indian Ocean’s tuna fishing industry. An official of the Seychelles Fishing Authority told SNA that the overall aim is to achieve a globally recognized standard for sustainable fishing for the region -- the Marine Stewardship Council (MSC) certification. “Then they [MSC] closely monitor the process to say that you continue to meet those criteria of sustainability,” added Robinson. As they aim to achieve this global standard, Seychelles and neighbouring Indian Ocean island Mauritius, along with Princes Limited, Thai Union Europe, purse seine fleets and their associations, as well as World Wide Fund for Nature have embarked on a new Fishery Improvement Project. An agreement was signed between the different parties this week to launch the project, as part of activities to commemorate the Seychelles Food Week – an annual event. 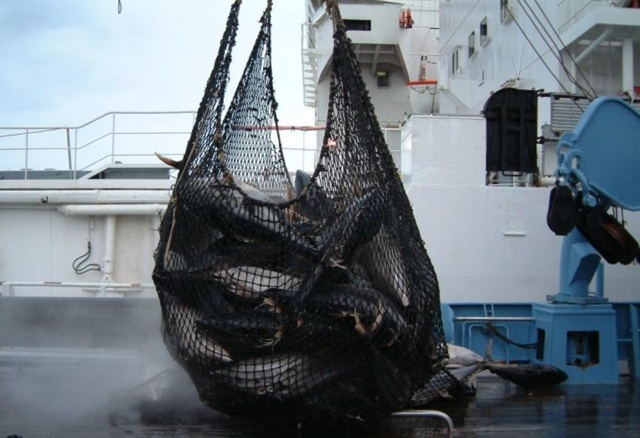 Yellowfin, skipjack and bigeye tuna caught by purse seiners operating in the Indian Ocean waters, are the target species of this new endeavour. Over the next five years, the partners will be by working closely with the Indian Ocean Tuna Commission (IOTC) to monitor the catch of around 40 French, Italian, Spanish, Mauritius and Seychelles-flagged purse seine vessels. “We also have to assess the by catch species such as some of the smaller tuna species, sharks, marlins and so on,” said Robinson. The Indian Ocean Tuna Commission (IOTC) agreed in June to reduce fishing allowances of the yellowfin tuna by 15 percent beginning next year, as scientists warned that they are being over-fished. The new project is also aiming to support the recovery plan of the yellowfin stock in the region. “This initiative is further testament of our commitment in ensuring the sustainability of this fishery, an activity which is center to the development of our blue economy and the livelihood of our people,” the Seychelles Minister of Fisheries and Agriculture, Wallace Cosgrow, said at the project launch. Fishing is the second pillar of the Seychelles economy – a 115-island archipelago in the western Indian Ocean. Some 50,000 tonnes of tuna are caught in the Seychelles Exclusive Economic Zone according to the fishing authority, although nearly 300 tonnes of tuna caught within the western Indian Ocean waters are landed and transshipped in Port Victoria. As the Fishery Improvement Project is also focusing on sustainability, healthy fish stocks and minimal and reversible impact of fishing on ecosystems, a conservation group -- World Wide Fund for Nature -- will be helping with the implementation. “We’re very encouraged that the Seychelles and Mauritius governments and the fishing industry in the Indian Ocean recognise the need to take action. We look forward to working with them to create meaningful change on the water and ultimately to deliver fisheries that can be MSC-certified,” said Daniel Suddaby, WWF’s Global Tuna Governance Leader. WWF will provide technical support and advice where needed and keep track the progress of the project over the coming years. Around 20 percent of the world’s commercially-caught tuna is said to originate from the Indian Ocean. “When governments, industry and NGOs are united in such an undertaking this becomes a powerful vehicle for positive change in the region,” said Dimmlich. The partners are currently working on an action plan to outline the major activities that will need to be implemented, improvement areas, and key performance indicators they will all have to commit to and achieve under the set timeframe.